Free from colourants, ethyl alcohol, hydroquinone, kojic acid, parabens, petrochemicals, phthalates, silicones, sulfates and ingredients of animal origin (except bee by-products). PROPOLIS (Cera Propolis) is a resinous mixture that honey bees collect from tree buds and mix with their salivary secretions to form a “bee glue”. They use it as a sealant for the hive. Rich in more than 30 potent antioxidant flavonoids and essential oils, propolis has powerful anti-inflammatory properties. LEMON FRUIT (Citrus Medica Limonum) is rich in antioxidant flavonoids, citric acid (fruit acid) & vitamin C. Lemon peel protects against sun damage, enhances collagen synthesis and inhibits the production of melanin to give rejuvenated flawless and lighter skin. Use 2x per day (morning & evening). Lather soap with warm water. Gently massage foam onto face using circular motions, focusing on the T-zone. 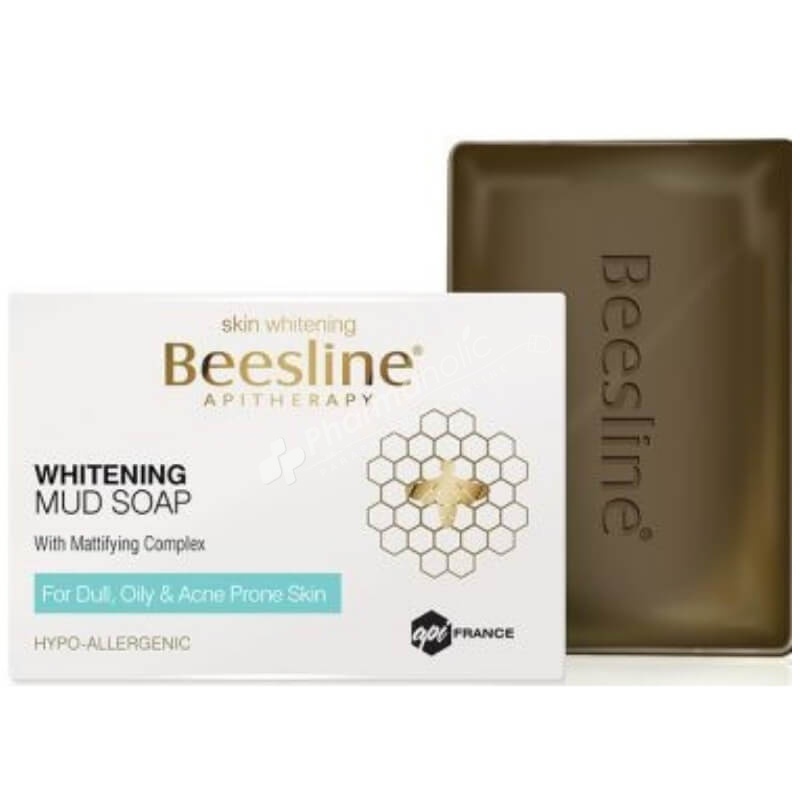 Follow with Beesline Whitening Day Gel SPF 30 or Whitening Lifting Night Cream. Vegetable Glycerin. Sodium Stearate. Sodium Cocoate. PEG-7 Oleate. Kaolin (Clay). Sorbitol. Aqua. Sodium Lactate. Maris Sal (Sea Salt). Salvia Ofﬁcinalis (Sage) Leaf Extract. Citrus Medica Limonum (Lemon) Peel Extract. Thymus Vulgaris (Thyme) Leaf Extract. Mentha Piperita (Peppermint) Oil. Lavandula Angustifolia (Lavender) Extract. Propolis. PEG-40 Hydrogenated Castor Oil. Eucalyptus Globulus Leaf Extract. Rosmarinus Ofﬁcinalis (Rosemary) Extract. Eugenia Caryophyllus (Clove) Bud Extract. EDTA.